I pulled up in my pristine white Bentley, window opened a crack. “Five pounds for the sign?” The tramp looked at me, then at the sign, confused behind a face of beard and overgrown hair. I opened the window a few inches more and offered credibility, a crisp note, tantalisingly out of reach. “Ok..” he said hesitantly. I dropped the passenger window a couple of inches. “Put the sign in!” He obediently turned the sign horizontal and posted it, dropping onto the seat which I covered with clear plastic from my dry cleaned suits. He stood there expectantly, outside my tinted window. I accelerated briefly, keeping an eye on his expression in the wing mirror. Expectancy turned to subdued anger. By this stage in their life, they didn’t feel they deserved anything. I braked twenty feet away and waited for him to walk to the window. Without words, I slipped the note out and he snatched at it, just as the window slid silently home. ‘Will work for food’ – I thought about pulling over, but decided against it. Such low standards. ‘I can predict the future! You give me money’ – That was more like it. I gave them a bag of pennies totalling four quid, stiffing them out of the agreed five. They’d find out too late, scrabbling with cold fingers to count them. My lips formed a sneer at the thought. ‘SPOILER ALERT! Will reveal ending of new Star Wars film unless you give me change’ – That was more like it. But I wasn’t going to break a tenner note. “Ten pounds for the sign?” They agreed immediately, going postman with the sign that dropped on top of previous purchases. I had an open pack of Marlboro’s on the passenger seat. I emptied out most of them leaving five. “Here you go!” I pinged the packet out, not waiting around, accelerating away arrogantly, slowly enough to hear, “But I don’t even smoke!” The rearview mirror acted as cinema screen, the tramp giving chase briefly and hitting the boot with the packet of cigs, then predictably bending over to pick them up off the wet street. I was disgusted. Half of these hobos were dressed in good clothes, clean shaven even. Finally, I spotted a female. She looked good enough to be prostituting herself at the very least. Slumped against a closed corner shop, she looked moody, and my suspicions of her being a looker were dashed in more favourable light. Canals need to be fed’ – A sense of humour still intact. I stopped on double yellow lines. She didn’t even look up, staring into the pavement, her focus in life. A hint of movement in her green eyes. Without raising her head, her eyes met mine. Looking around there were few people about. Time to break with convention. I didn’t usually get out..
My seat belt melted away and I was ready to open the door. She was there, inches away, her hoody now pulled up, breathing heavily, her breath suprisingly fresh. If it wasn’t for her sign I’d think her a simpleton. Instinctively I raised the window allowing a two inch gap. “Last chance. Fiver for your sign?” She looked backwards at it, and her neck twisted back round. “Alright. Show me the money.” Her tone was drawn out, leaking life. I flashed the tenner. 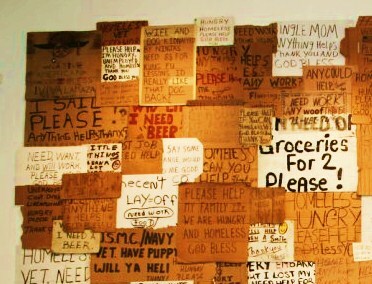 Months later I would exhibit and sell my large collection of signs for nearly half a million to a private collector. Interesting story–even though your protagonist was a monumental jerk.